Nike has been a model of consistency for the footwear space. They are quick to adapt to market shifts, producing relevant footwear options for the latest craze. The continuous buzz that flows through the running air waves is the notion of a minimal shoe. Runners prefer an experience that keeps them closer to the ground. This platform helps to mimic the notion of barefoot running, which represents the best ways for our feet to adapt to different surfaces and unlock our true stride potential. 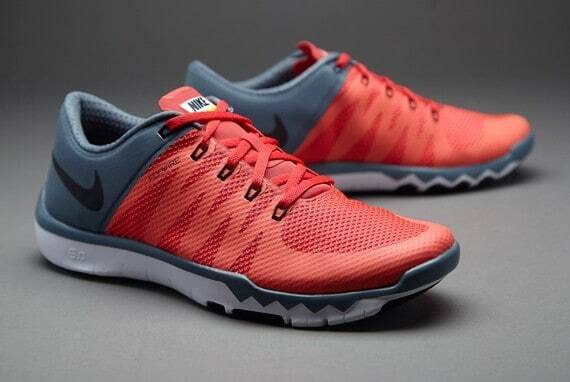 The Nike Free Trainer 5.0 v6 is the response to these desires. It houses many different components that helps accomplish a minimalized fit and utilizes elements that keep the overall weight of the product low. We will detail the aspects that make up this shoe, defining the different functions of these included aspects. We start with the positives and negatives surrounding this release. Nike has been experimenting with minimal builds. Most of their designs in the running field have featured coverage in the minimal space, but haven't been able to fully reach that title. The Nike Free Trainer 5.0 v6 model covers that spread and then some. The commitment to lightweight materials and functioning allows for the foot to perform in its natural tendencies, reducing forced movements and adverse holding patterns. This shoe also avoids the flashy terminology and complex makeup. It takes a direct approach to the applied space, conquering the competition with means of lightweight support that work together nicely. Check Price on Amazon! Phylite technology severely reduces the weight in the midsole area without sacrificing support and shock absorption. Made from mesh materials which brings the total weight down. Flex grooves at the outsole apply to your stream of movements. Outsole grooves also work to target the highest areas of pressure and combats them with padding. No-sew design helps to reduce constriction on the foot. Flywire technology introduced at the midsole for increased support and holding. Low-profile design keeps your foot slightly lifted off the running surface. Removeable inserts make fitting a breeze. This product line expands in multiple directions in terms of designs and color combinations, creating multiple styles to suit your wardrobe. Elastic lace holders allow for proper lace-up and tightening mechanisms. Rises to mid-ankle height, leaving some of the ankle exposed. The no-sew design can cause the materials to separate and come apart over time. Color tends to chip and fade over time. Elastic lace holders can also wear over time. The benefits for running barefoot have been studied and examined. The results have proven to be better for the body. The impact on the foot is something that is catered to in running shoes. We exert our pressures into the sole of the shoe and not the soles of our foot. When this pressure is exerted, the level of exertion on the foot in running shoes increases immensely. Three times our body weight is under pressure when generating push-off or striking in running shoes, making their function a damper on our feet and the rest of our body. To help avoid this, minimalized shoes have been developed. The minimalized shoe keeps you as close to the ground as possible and only provides the necessary support means. The Nike Free Trainer 5.0 v6 expands upon this space with this release. The main feature surrounding minimalized shoes is their ability to be lightweight. The 5.0 v6 version is made from mesh materials the surrounds the majority of the outer shell. Phylite technology is utilized at the midsole area. This is a combination of make-up that comes from rubber and phylon materials. Phylon is much lighter than rubber, which makes this area rather minimal in material weight. Nike also completely removed the notion of sewing stiches into the materials. When stitching is prevalent, it can weigh a shoe down. These three constructions help to keep the weight low, leaving Nike with the desired minimal build. There are many different areas to expand upon with this model. While the main concern is the weight of the shoe, additional factors and considerations mark for proper usage. Below we'll detail these components and describe their usage. With Nike, the fit often runs small. The user would be best to go up a size to compensate. The Free Trainer design is naturally narrow, due to the proprietary means of makeup. With that being said, mesh is an expansive material. It can stretch a little to fit the foot and it doesn't grip the foot or announce a defined structure like synthetic material would. This makes it a versatile fit for the user, allowing the material to form fit the foot. Due to the comfort design, this also makes for a great fit for people with adverse foot sizes or rises in the arch. It caters to any pronation you have, allowing the materials to be attracted to these areas. If you have a wide foot, it is best to upgrade to the EE sizing. The great benefit surrounding these features is that Nike expands their models to meet all of the different sizes on the foot scale. The outsole of the shoe features a tacked rubberized component. The base sits about half an inch off the ground, which is important to keeping that minimal build and structure. The draw of the outsole comes at the undercarriage. Flex grooves extend slightly from the bottom of the shoe. These grooves are placed carefully, ensuring they reach the proper areas of benefit. They work with tendons and the bones of the foot to limit the amount of pressure these areas face. The bottom also utilizes little cuts in the rubber, which help space out the total impact to the entire foot. This limits the attention any one area of the foot receives, allowing you to host prolonged usage without feeling the effects or becoming fatigued. The midsole represents a thin layer of support that maximizes durability and cushioning concerns. The Phylite material is proprietary to Nike's brand. This material is made from a combination of rubber and phylon. Phylon gives the shoe the lightweight notion, while the rubber adds to the durability component. Phylon also doubles as cushion, mimicking the properties of a memory foam. This brings sensations of padding and comfort to the bottom of the foot. This layer is also responsible for shock absorption, allowing you to travel across adverse terrain with ease. The upper is designed for a simple fit that fully surrounds the ankle. It is treated with the same mesh materials that makeup the outer shell, which gives it the same properties. These properties include the ability to apply the right fit without too much hassle thanks to the give and versatility of this fabric. The upper also meets up with Nike's Flywire technology, which acts as a holding device. Wavy lines of this material are featured on the outer shell. These rubberized components provide even holding and proper supports to the sides of the foot. This helps keep you upright and allows your body to align with your feet. It makes for a strong piece in helping you utilize the full function of your body when developing the proper stride. We have introduced three separate functions that work to reduce the weight of the shoe. Phylite material keeps the midsole area under the weight of most competitors. Mesh is one of the lightest construction materials and it continues to offer a user-friendly material that shapes to any foot size. There are no stitches for material holding, which keeps the shoe both spacious and lightweight. The total weight comes in a little over 8 ounces, which is the proper amount for a shoe hosting this low-profile build and for striving for the minimalized design. Not only is mesh lightweight, it also allows for the greatest admission of air amongst the materials that makeup shoes. It creates a strong barrier for support against the elements, making it a good fit for the outdoor runner. A thin layer of padding is also introduced at the insole. This padding runs across the entire insole and extends to treat the bottom portion of the shell. This feature ends at the shoe collar, where it wraps around the outside of the heel cup. This creates for a secondary location for air flow. The air escapes through the outer shell and the back-heel cup. These two functions help to limit overheating and reduce the development of foot blisters or athlete's foot. The comfort means start at the outsole of the shoe. The extended rubber hexagons that we introduced previously help to reduce pressures on key areas of the foot. Evenly distributing means of pressure allows for a smooth ride, no matter the distance of the run. Removeable inserts keep you from swaying from your norm. They can be used as an applied mean of cushion, stabilizing the foot as your run. They can also be removed so you can apply thicker socks. Whatever the case of foot dressing, the shoe can adapt to your settings and preferences. The toe box is an applied region of comfort for the toes. It is both spacious and it takes the shape of the foot, applying the proper means for natural sitting. While mesh is a light material, it also possesses components that make it resistant to elements. This mesh is treated to apply water resistant means, reducing liquid absorption. It is also stretchy and very difficult to tear, leaving abrasion resistance as a second durability benefit. Specific cuts to the outsole in conjunction with the undercarriage design and midsole build creates a strong force to take on the pressures of the running surface. These elements are responsive and function at a greater pace when combined. The desired surface is one that is flat and smooth. This shoe possesses proprietary means that have taken on many forms of testing. These applied means are designed to benefit the user when used in the proper capacities. This makes the flat and smooth surfaces the best case for hosting these benefits. Rough and off-road surfaces are still fair game, but they can increase the wear and tear your shoes face. The prescribed elements might also become less noticeable to the user, leaving additional pressures on the foot. While there are limited elements supporting strong-standing, the shoe does accomplish the elements needed in a minimal shoe. The outsole sits lower to the ground, keeping the foot in-line with the surface being traveled. This is the desired space for the shoe, leaving little function or support introduction in the stability space. The upper design helps keep the foot in the proper positioning, which makes a strong case for continued stability. One of the primary properties of a minimal shoe is its ability to be flexible. The front of the shoe emits the proper flex. This is made possible due to the outsole thinning out and the mesh materials. This allows the toe box to bend about halfway to the midfoot. This area is a primary generator for push-off and landing, which requires the flex of the shoe to match up to the natural flex of the foot. The back of the shoe remains relatively firm, offering little flex at the heel area. This is important for proper footing and stability. The midfoot area stands firm, making it a fitting proponent for all the different arch types a user could host. Due to the properties described, this minimal shoe makes for a great partner to proper stride development. We can all use some treatment in this regard, leaving this model a perfect fit for walkers and runners alike. Most of the daily activities we perform would benefit from being barefoot, making this minimal build a great fit in other spaces. Weight lifting requires natural explosion, so this low-profile build can host success in the gym. Multiple usages can be developed as long as the minimal mindset is put forth. The Free Train Versatility model holds a few differences when compared to the 5.0 v6 model. It is made up of synthetic and textile materials. This material still holds the lightweight title, but offers less flex and versatility than the mesh design. The shoe introduces Flywire technology at the midsole and the lace-up area. The addition in the lace area provides lockdown support of the foot and keeps the foot stable, preventing shifts and slippage. The outsole features a similar design technique, implementing the hexagonal shapes to reduce pressures on key areas of the foot. The back-insertion point is a little more thinned out, offering some give to the back of the heel/ankle area. This model also sits a little higher off the ground, making it less minimal than the 5.0 v6 model. The 2017 Nike Free Runner model holds some of the same properties that makeup the 5.0 v6 model. It is made from mesh materials and the overlay is done in a sophisticated manner to ensure it is both thin and durable. This shoe does introduce minimal amounts of stitching to ensuring the strength element can be emitted from the mesh material. The main feature that allows this comparison model to excel occurs at the outsole area. It houses a rounded heel, which helps roll with the ground as you stride. This helps reduce ankle injuries and provides a better platform for continuous push-offs and landings. The Free Trainer product line has come a long way since the introduction of the 3.0 v4 sneaker. This model was made of synthetic materials. This shoe also showcased some unique patterns in design, crisscrossing the materials and enhancing the color schemes available to the user. Not only were they visually flashy, their price tag was not something to bat your eye at. This model held a synthetic sole, which was upgraded to a rubberized element with the most recent releases. This marks a fitting comparison to the areas where Nike cinched up their design formats and material usage. This model holds a similar build to that of the 5.0 v6 version, allowing it to possess similar performance capabilities.